Could Rick Scott Hand Florida to Obama? 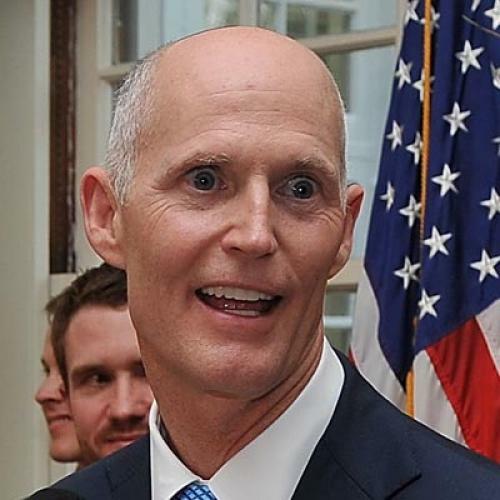 Tallahassee, Florida—Since getting elected last year, Florida Governor Rick Scott, a Republican, has had a rough go of it. In his short tenure, he has been sued by teachers and law enforcement unions, the American Civil Liberties Union, physician groups, environmentalists, advocates for the disabled, and even a Republican state legislator. He’s also managed to irritate the media and public protesters, which only muddied his already tarnished image. He is now a regular punch line on Comedy Central’s “The Colbert Report,” which has likened his bald visage to Harry Potter’s nemesis, Lord Voldemort. “When you make tough decisions, some people don’t like it,” Scott explained to former Arkansas Governor Mike Huckabee on Fox News recently, after the former presidential contender confessed he was “stunned” by Scott’s political toxicity. BEFORE ENTERING OFFICE, all many voters knew about Scott was that the Texas transplant had built the nation’s largest hospital chain, Columbia/HCA, and resigned as CEO in 1997 amid the largest Medicare fraud investigation in the nation’s history. Scott was never charged in the scheme that culminated in $2 billion worth of fines paid by the company, but the controversy dogged his gubernatorial campaign. A smaller number of voters might have remembered when Scott re-launched himself on the national stage in 2008 as the financier behind an ad-buying campaign called Conservatives for Patients’ Rights, which was critical of President Obama’s agenda for health care reform. Thanks to the endeavor, Scott was able to garner Tea Party support by claiming some credit for defeating the “public option” in the final reform package. It also helped him blindside the chummy but scandal-plagued Florida Republican establishment, which he defeated by pouring $73 million of his own personal wealth into a late-stage gubernatorial bid. But, while every other Republican statewide candidate posted double-digit victories, Scott barely squeezed past Democrat Alex Sink, winning by just 61,550 votes out of 5.36 million votes cast—or 1.2 percent. Unlike Wisconsin’s Scott Walker or New Jersey’s Chris Christie, “he didn’t have any political capital going into office,” admits Scott’s pollster and political strategist, Tony Fabrizio. And any goodwill Scott retained soon went out the window with a series of miscalculations following his election. The trouble began when Scott hired glitzy presidential event planners and private security for a two-day inaugural party in Tallahassee. To veteran Florida media and political hands, the event made Scott appear out of step with the small-town pace of the isolated capital city. Soon after, Scott had another mishap when he held a private dinner with legislative leaders in the governor’s mansion and alienated journalists by locking them outside the gates after they had refused to let his office hand-pick a pool reporter. Then, when he approved the state budget in May, Scott committed another snafu at the signing ceremony, which took place in a sprawling retirement community called The Villages. Before the governor even arrived, his staff ordered local deputies to remove protesters from a public square. A week later, the governor’s office admitted it had erred, but the scene provided yet more fodder for Democratic activists to paint Scott as an aloof, aristocratic corporate raider at the seat of government. And so, eight months into his term, Scott has become arguably the least-popular governor in the country. He was polled sitting at 33 percent job approval in mid-June, according a to Democratic-aligned Public Policy Polling survey, which also found that 59 percent of voters disapproved of him. (A more recent poll released by Quinnipiac University found that his job approval rating has since gone up, but only slightly, to 35 percent.) Other recent surveys have found his support below 30 percent. Worse, a whopping 64 percent of independent voters indicated that they disapproved of Scott in the PPP poll. But, with campaign action soon heading to the Sunshine State and Scott’s political fortunes unlikely to turn around anytime soon, there is still cause for concern. At the very least, the governor’s rocky tenure could be an important factor in determining which way Florida goes in 2012. At the worst, for Republicans, it could be the decisive one. Aaron Deslatte is the Tallahassee bureau chief for the Orlando Sentinel and South Florida Sun Sentinel.